A. Use a pair of clean, sharp cutters to prune off desired branches. Place the cut ends in water until you are ready to use them. You can crush the ends of woody stems so that the branch can take up more water. Another option is to place the greenery in water overnight to allow the cutting to absorb more water. Dry the foliage and apply an anti-desiccant to seal in the moisture. Using an anti-desiccant on juniper berries, cedar, or blue spruce can damage the wax covering that gives the plants their unique coloration. Apply anti-desiccant products outdoors when the temperature is above 40 degrees Fahrenheit. If you are making a wreath or other arrangements, store in a cool location until you are ready to use them. 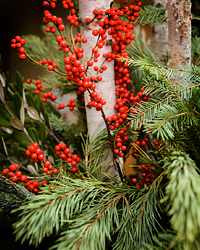 Keep the greenery away from direct sunlight and a heat source at both the preparation and display stages. You may have to replace greenery throughout the season. Please contact Plant Information at (847) 835-0972 or plantinfo@chicagobotanic.org for more information.